In contrast to numerous leaks and rumors, Apple finally revealed its two new thinner, bigger and faster smartphones — iPhone 6 and iPhone 6 Plus — and a new smart-watch called the Apple Watch. Apple has finally entered into Big Screen segment by launching a 4.7 and 5.5 inch version of iPhone 6 and iPhone 6 Plus respectively. Apple has removed its 32 GB version in iPhone 6, which will now come in 16, 64 and 128 GB. The unlocked version of iPhone 6 starts at $649 while cost of iPhone 6 Plus starts at $749. Apple iPhone 6 and iPhone 6 Plus are the thinnest smartphones with 6.8 and 7.1 mm excluding Chinese Gionee’s Elife S5.5 which has a thickness of 5.5mm. Thickness combined with a curve looks quite good and gives a feel of having a worthy product. 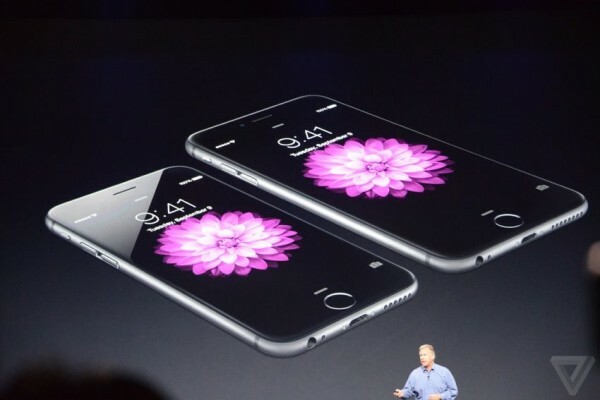 The glass front of the iPhone 6 curves around the side, and each model features an anodized aluminum back. There is not much change in camera and is still 8MP with True Tone flash, 1.5 micron pixels, f/2.2 aperture and an all-new sensor. The camera has a phase detection auto focus, which will provide faster auto-focus while taking pictures. This will result in better picture quality and performance in low light. Apple has introduced a new generation of processors called A8. Processors are same for both the phones having a a dual-core (reported) 1.4GHz 64-bit CPU. A8 chips are smaller than A7 and will deliver over 25% more performance than A7, with 50% more energy efficiency. iPhone 6 will carry same battery life as was with iPhone 5S. iPhone 6 Plus will have more battery life due to much larger battery.